Cross a luxury car with a spa, and you might get something like the 2014 Mercedes-Benz S550 that hits U.S. showrooms Tuesday. 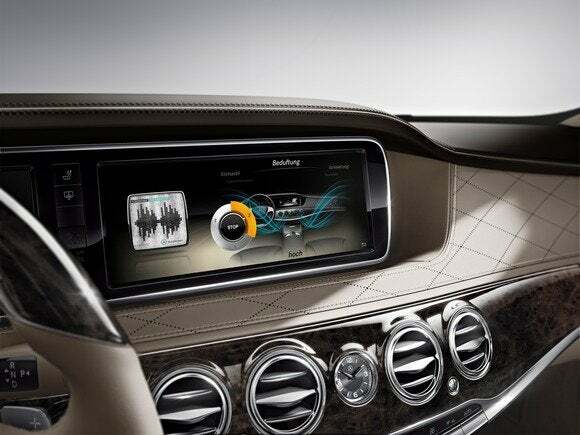 This high-end car, with a base price of $92,000, now offers touchscreen control over some surprising creature comforts. Do we need this stuff? No, of course not. Is it fun to think about even if you could never afford this car? Absolutely. What, no smell of money? Forget it then. Just tuck one of four custom-made scents into its special place in the glove box, and inhale deeply. New-car smell is so bourgeois. The S550 lets you activate a scent-control system to “perfume” the interior. Mercedes-Benz offers specially created scents including Sports Mood, Nightlife Mood, Downtown Mood, and Freeside Mood (that last scent’s name might make more sense in German). All of the scents are intended to be subtle fresheners. An empty vial is included with the purchase of the car for you to fill with your own alcohol-based fragrance. While driving fatigue seems unlikely in a car this luxurious, the S550 also offers optional massage chairs for the driver and passenger that can simulate, among other things, a hot-stone massage. There are six massage styles available in total. Fourteen different air chambers within the seats inflate and deflate to simulate the massage styles. You activate the massage and customize the treatment from the touchscreen display. The massage feature is also available to rear passengers with the car's optional Executive package. A few luxury cars, including previous models from Mercedes-Benz, offer a massage feature, but according to the automaker, the S550 is the first to offer this many massage styles, let alone a rolling hot-stone feel. Optional massage chairs with 14 inflatable chambers let you choose among hot-stone or five other styles. Oh yeah, the S550 also offers some new technical marvels that affect the actual operation of the vehicle. A feature called Distronic Plus with Steering Assist that keeps the car centered in your lane automatically. It works at speeds up to 124mph. Similar to the Lane Keeping Assist System in the 2014 Acura RLX, the S550 sedan uses sensors to monitor the lane markings. The technology is one of the leading precursors to future autonomous driving. If that’s not enough to help you drive more confidently, the car can brake automatically in an intersection to avoid a side collision, maintains your speed using adaptive cruise control, and can fully brake at city speeds below 31MPH if it detects an object or person in the road. A new suspension feature called Magic Body Control scans the road ahead and adjusts the suspension accordingly—making a rougher patch of road more bearable. The center touchscreen controls the fragrances, massages, and other creature comforts. Go ahead and scoff at the S550’s spa-like experiences, but think about it this way. As cars become more connected to the roadway, other cars, and the surrounding environment, we will likely benefit from more of these comfort settings—especially if they encourage us to spend even more time driving. Hmmm, maybe that smell is one of conspiracy. This story, "Ooh that smell: Mercedes-Benz S550 debuts with custom scents and hot-stone massage" was originally published by TechHive.